2) New feature: "Coin Settings"
You can now choose for every coin (and even every variant) if it should be displayed in the program, e.g. you can limit the software to display 2 euro coins only. There is a tutorial avaiable for this new feature. For every coin you can get now information about the used obverse, i.e. the common side of the coin. 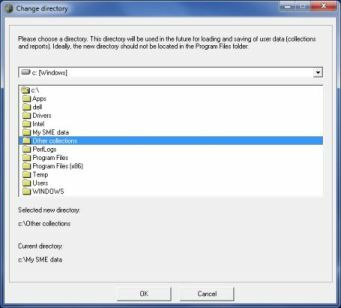 4) New feature: "Change User Directory"
You can now choose the directory which is used to store user data (collections and reports). 5) Bug fixes, translations and other improvements. For further information please visit the SME homepage. Please also notice that there is a special discount price available for all euroHOBBY Members. This discount is ONLY available via this order form. 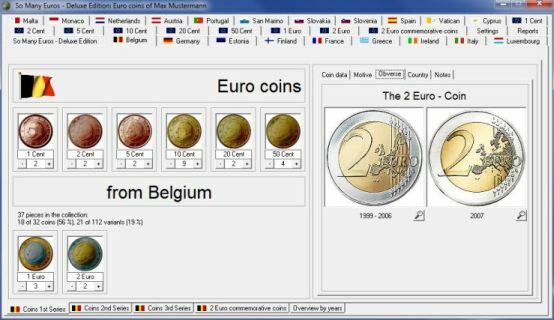 VERY GOOD CHANGES.I GOT THE PROGRAMME.VERY USEFUL AND SIMPLE IN USE.AN IMPORTANT TOOL FOR EVERY EURO COINS COLLECTOR.